Al-Naʻati had his own reasons for opting to stay when he could have left with his neighbors a year ago. But the current situation in Yemen, devastated by two years of war, could soon force his hand. “It has to do with eking out a living. There’s no more living because of the crises and because I no longer have a job,” said al-Naʻati, who used to make jackets out of fur and sell them in the local market. “Now, we have sold half of our belongings [to survive],” he said. The war has rendered millions of Yemenis jobless, and caused rampant inflation. Over one million government employees—upon whose salaries an estimated nine million people depend—have not been paid for four months now. “Everything is expensive and there’s no longer income,” al-Naʻati complains. Saʻid al-Naʻati outside al- home in Raydah. Photographed by the author. The emigration of al-Naʻati’s fellow Jews has also made his life harder. “Our hope has been to stay,” al-Naʻati said. “With the extinction of Yemenite Jewry, however, one can’t live alone as a Jew [among Muslim people] because our religion doesn’t allow it. We need someone to prepare our meat. We also want [our sons] to get married to [Jewish women] and we want to marry off our women..” Al-Naʻati lives with three of his daughters now. Of his three sons, one now lives in the US, and one in the United Kingdom. The third is in Sanʻa, Yemen’s capital, where some 40 Jews live in Tourist City, a guarded complex, for safety reasons. Intermittent attacks against Jewish communities have been among the factors contributing to increased emigration in recent years. In 2007, the Jewish family of Al Salim, who lived in Saʻdah Governorate, was expelled from their village. The Houthi movement, known for its anti-American and anti-Israeli sentiment, was then at war with the central government; they issued a fifteen-day ultimatum for the Jews to leave. The Houthis gave no reason, but they apparently suspected the local Jewish community of aiding the government in some way. No proof to that effect was ever provided. Then-president Ali Abdullah Saleh relocated the Jews of Saʻdah to Tourist City in Sanʻa and began paying them a monthly stipend. Even after the Houthi movement—with Saleh’s support—seized power and took control of Sanʻa in late 2014, the government’s nominal protection of the Jewish community has remained in place. Yemen’s Jews are indigenous to the region. Archeological records show that Judaism has been practiced in southwestern Arabia since at least the second century BCE, and many sources say it dates back much further than that. Jewish dynasties rose and fell in Yemen long before the advent of Islam. 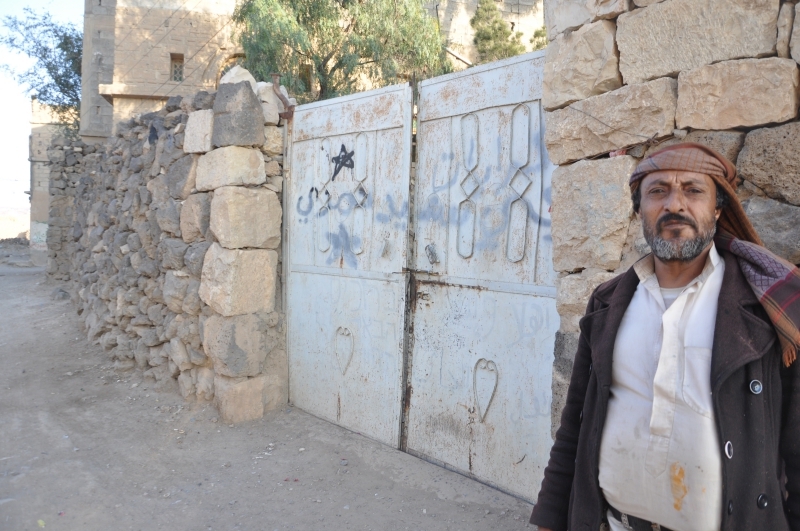 Since the rise of Islam in Yemen, local Jewish communities have endured periodic persecution. During the last fifty years, the Yemenite Jews have been treated as a second class. In 1949 and 1950, the Israeli government and The Jewish Agency brought tens of thousands of Yemeni Jews to Israel. Many smaller groups have made Aliyah since then. Those who remained in Yemen have kept a low profile since. In the past fifteen years, two Jewish people have been murdered, both by men said to be Wahhabis. The most recent victim was killed in Sanʻa by someone who reportedly claimed to have been sent by God. The victim’s son accused al-Qaeda’s Yemeni branch of inciting the killing. A child peeks through the gate of one of the historically-Jewish homes in Raydah. Photographed by the author. Culturally, Yemeni Jews have much in common with Yemeni Muslims, but they also maintain their own unique traditions and religious beliefs. Jewish men wear long payot, or sidelocks—often hidden while in public—but they also wear the long white robes and scarves common among northern Yemenis, and Jewish women are covered completely while in public. They also have their own rich culture of literature, music, crafts, and traditions that set them apart from both Yemeni Muslims and non-Yemeni Jewry. Shuaib Almosawa is a freelance journalist based in San'a. His work has appeared in The New York Times, Foreign Policy, The Los Angeles Times, The Daily Beast, The Independent, BuzzFeed, and Inter Press Service. Shuaib has also appeared on the BBC World Service and YLE radio and television.